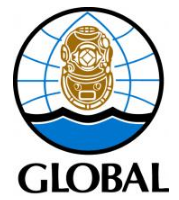 A Closer Look at Global's Logo - Global Diving & Salvage, Inc. If you look closely at the gold diving helmet in the center of the Global Diving & Salvage logo you might notice that there’s something missing. It’s a subtle, slight mistake that – 35 years ago – fit the vision original owners Thom Davis and John Graham had for the company. At the time, the founders were mostly single guys leaving well-paying jobs to start a dive company without much startup capital. But, what they lacked in funding, they made up for with a long-term vision. So, while Grennan doesn’t know the exact origin of the wingnut omission, it fits the company’s humble beginnings – a tribute to a tradition that endures to this day. Other aspects of the logo provide a peek into the history of the company and the industry. For instance, the helmet; Global was started at a time when people were transitioning from the heavier helmet pictured (a Mark V) in the logo to a lighter, fiberglass one. So, why did Davis and Graham want to showcase an older helmet? In addition to paying homage to the history of diving, “they wanted something that was bold and recognizable,” Grennan said. Just under the helmet in the logo, there is a thick black line, tracing above the blue waves below. That line symbolizes oil. Completing the logo are latitude and longitude lines, forming the frame of a globe that circles the rest of the image. While the company had humble beginnings, adding “global” to both the name and imagery was a testament to the bold vision of what the founders’ believed the company could create. “We are very fortunate that they didn’t call themselves Seattle Diving, Harbor Island Diving, or Puget Sound Diving because we would have had to change the name a long time ago,” Grennan said. Looking back on that original image, only one thing has changed throughout the company’s 35 years. Where it used to read: Global Diving & Salvage, Inc., only one word remains – Global. The company has grown over the years, but Global remains true to its roots.